More often than not, when people think of orthodontic braces they picture metal brackets and wires. However, there is an alternative. Invisalign uses clear plastic aligners to move your teeth. These braces can often address the same orthodontic problems as traditional braces, but it a much more discreet fashion. 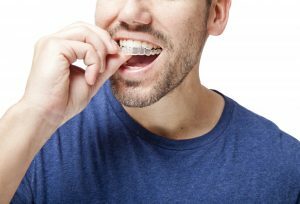 If you’re considering Invisalign in Las Cruces, then please read on to get answers to some of the most commonly asked questions about this orthodontic system. While your undergo orthodontic treatment with Invisalign, you’ll wear pairs of aligners. The pairs are organized into a sequential series; as you progress from one pair to the next, you’ll gradually begin to see your teeth move. What Makes My Teeth Move? Invisalign aligners use controlled force to move your teeth. The force is targeted and timed. This means that only certain teeth will move during each stage of your orthodontic treatment. Does Wearing Invisalign Aligners Hurt? Some patients report mild discomfort when they switch from one pair of aligners to the next, but this usually goes away in a day or two. However, you’ll never have to worry about a bracket irritating your gums or a wire poking your cheek when you wear Invisalign. What are the Benefits of Wearing Invisalign Aligners? If you are an adult with a busy career and social life, then the primary benefit is that Invisalign aligners are hardly noticeable. Made of clear BPA-free plastic, the aligners fit snuggly over your teeth. In addition, Invisalign clear braces are removable so you’ll be able to eat all of your favorite foods and maintain your regular at-home oral hygiene routine. How Many Hours Will I Have to Wear My Aligners? Your dentist in Las Cruces will need you to wear your aligners every day for at least 22 hours a day. This should leave plenty of time for you to enjoy meals and take the time necessary to adequately brush and floss your teeth. How Long is the Treatment Time for Invisalign? Your individual orthodontic needs will dictate the length of treatment. However, most adults are able to complete their orthodontic care with Invisalign in 12 to 24 months, which is quite comparable to treatment time with traditional metal braces. How Often Are Progress Checks Scheduled? Drs. Ortiz like to see their Invisalign patients about every four to six weeks during treatment. The visits are quick, but are necessary to ensure that your teeth are moving as planned. We’ll also use these visits to dispense your next set of aligners. If you have any more questions about Invisalign, please call Painted Skies Dental Center today. We’ll be glad to speak to you over the phone or schedule a consultation.